How do Keywords Work? It’s Not So Confusing Afterall. There has been much confusion about the “point” of using keywords on your website and I want to add some simplicity and some clarity to the term “keyword”. First, what is a keyword? A keyword is a word that someone types into a search engine (like Google). It is when they are looking for something. It could be absolutely anything. For example, if someone was looking to redo the flooring in their house, they may search for something like this in Google. When someone types in this search, Google provides them with what they deem as the most relevant and useful search results. These results are websites like the ones that you can create within Wealthy Affiliate. How do you get ranked under keywords? Engaging, quality content…will lead you to getting rankings under keywords. As you move forward through the training here at WA, you are going to see ongoing emphasis on this. People often times think they need to create their content for search engines because that is where their websites get ranked, when in reality search engines are looking for quality, engaging content that focuses on the people reading that content. A keyword is the most powerful thing an online marketer can understand as it is the premise of someone looking for help. If you can help someone, you can build a business doing so. 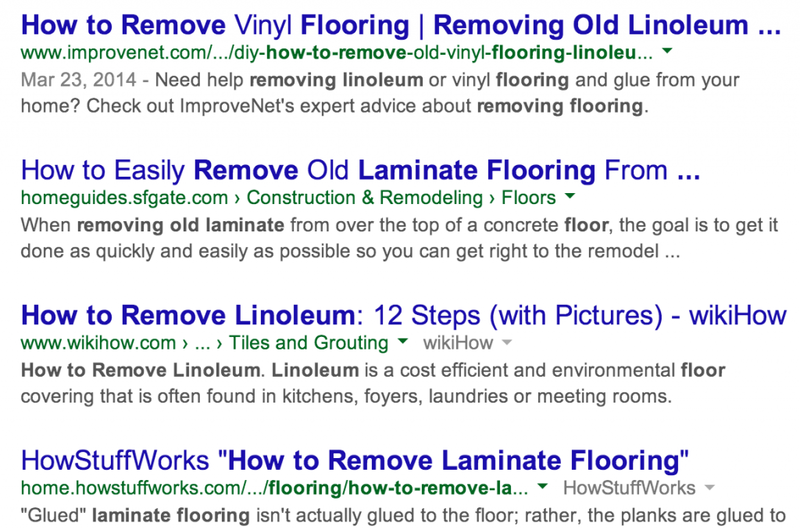 Once you have a keyword, your next natural step is to create content targeting that keyword…in this case, I would target “how to remove laminate flooring” within my website content. As you can see, there is a variable called QSR. That is the TRUE # of competing pages you are up against in all of Google. Keywords under 300 QSR are quite easy to rank for and there are millions of these that become quite apparent as you perform keyword research using Jaaxy. Important Note: When a website gets ranked on the 1st page in search engines, their relevant page comes up in the rankings and as a result, they will end up getting traffic from the “people” searching those keywords. So Keywords = Traffic! Traffic = Opportunity! And once you have traffic, you have the opportunity to make money from your website in MANY different ways. You can do this through affiliate programs, you can do this through advertising, or you can do this through the building out of an “email” list. 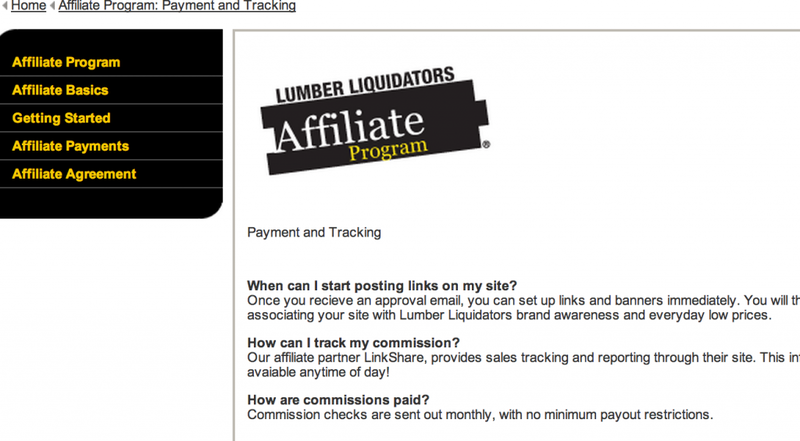 One example for this particular example could be joining the Lumber Liquidators affiliate program, which pays 4% commission on all types of flooring. If I got ranked under the keyword “how to remove laminate flooring”, there is a good chance my traffic would be interested in purchasing new flooring. If I sent them to this website through the affiliate program, I would earn a 4% commission on each sale, average commission for me being $40-120. Making content your first and foremost emphasis is priority though. That is the emphasis first and foremost is creating your website, building out your content (targeting keywords), getting traffic and then earning money. If you focus on the money initially, you will skip the important stuff that will lead you to actually making money so make the creating of quality content and targeting keywords your initial focus. So PLEASE make sure when you are starting out a website that your focus is not initially on the making money part, you first have to get traffic before you can make money. If you create quality content, search engines will find you. Every page or post that you create on your website will target a keyword phrase. You should be targeting the “concept” of your content to a particular keyword. You should also be focusing on creating QUALITY content that helps your reader. There was a day when people used to SPIN content and use automation tools to manufacture fake content that would “trick” Google and other search engines, but that is no longer relevant and actually will kill your website rankings (if you attempt to do this). Google tends to rank websites very well that do provide this quality reader experience and as time goes on, they are getting a better and better grasp of what constitutes quality, engaging content, and what should be ranked high in their search results. Will I Rank for Every Keyword I target? Absolutely not. Over the years, I have created content that has never ranked. That is fine. Too many people get fixated on trying to rank under ONE keyword and they end up spending all their time and energy…yet never get ranked. They fail as a result. These very same people would have been much more successful if they had simply created more pages/posts on their website targeting more keywords. More content, targeting more keywords, equates to more rankings. Any given keyword ranking is out of your control and by targeting MORE keywords and creating content more often, you are going to ensure your chances of getting ranked under many more keywords. PS. If you want a competitive keyword advantage over your competition, you need to get your hands on Jaaxy for your keyword research. Seriously! Kyle, thanks for your great info about keywords and how keyword tools can help. I have been using Jaaxy as my keyword tool. it is working for me and I feel you and Carson are geniuses when it comes to anything related to the Internet business world. Now, I am clearly using Jaaxy every day and benefiting from the platform. I love being able to get access to the QSR data in an instant, something that would take a normal person without Jaaxy as their disposal hours to find (instead of seconds). Glad you are enjoying Jaaxy Christian, it was built as result of our displeasure of other keyword tools in the industry that either provided false/fake data (which many of them doing) or completely useless and fluffy data that provides little to no value to ones business. Great article about keywords against content. I have been a student of yours for 5 years now and I have learned to write the content, use the keywords if I have any and let my content drive my sites. I like the JAAXY tool and I believe it to be the best keyword tool there is today, but I don’t use it because I am focused on great quality content right now and I will look at keywords to fit my content later. Yeah, keywords are the premise of all content that you should be creating on your website. Every page or post that one creates should target a keyword. This gives you a chance to get rankings and as you start building out more content and getting more rankings…which lead to more traffic. Once you have an audience, the sky is truly the limit with your website! ….I have attended a bunch of your awesome “Keyword” and not only trainings Kyle , inside WA….Jay contributed much to my education as well…. Now I can clearly understand what is going on with the keywords.And I know how to target for one only keyword primarily , focused on creating quality and engaging content to the point I can.I am aiming in providing solutions for the people…. .And I think it’s working fine since I try to rank for only one keyword and then day after a day I can see inside Google’s Search Console that I am ranking also for way more keywords for just one post. I can’t believe how some websites …still….are over stuffing their poor thin content 5 pages websites and try to deceive people and machines. They try to rank with such poor material. ?..And what to say for the content spinners you mention. ?….And there are still training communities or “marketing experts” that suggest such tricky techniques…. Will this ever stop..? ?…No I doubt it… because as long there is “Money” involved…What you think.? Believe it or not, there are still many marketers that are teaching outdated “tricks” like content spinners, PLR content, backlinking and keyword stuffing to get rankings. These will not lead to rankings, in fact, they will actually put you in Google’s bad books and often times wipe you right out of the search results. Create quality, engaging, helpful and of course, topical content targeting your specific keyword and you will see rankings. As you continue doing this, traffic will be the end results and there truly is an unlimited number of keywords in every niche and a tap of traffic that never dries up. Thank you for a great breakdown on keywords that is as usual very clear, simplified and practical. Regarding your comment reply (ABOVE) – “You should never put too much emphasis on ONE keyword and definitely do not create many pages on your site targeting the same term” – would the search engines see it as spam if your posts/pages differed slightly but STILL mentioned in the KW the same (single) word, for example: vegetables, or fruit)? The focus would be different from article to article of course, like fruit for hypertension, and best fruits for diabetes or what fruits cure acne etc. Exactly, my point is that it is better to have 100 GOOD posts out there on your website than to focus on creating one PERFECT post. Too many people get caught up trying to get ranked under one single keyword and it can be the demise of your business. Ultimately it is up to Google where you rank and some keywords that you try to target you won’t rank for (not right away anyways). I know you are going to love Jaaxy! It took me some time to understand the concept of keywords in web optimization. So confusing that I decided to research and write a page about it. In the end, I get a clearer picture. The fantastic training in Wealthy Affiliate and the privilege of using Jaaxy has enable me to put theory into practice and help me understand a lot more about keyword research. Glad the training helped you out. Far too many really do overthink the concept of keywords and I believe in many cases, put too much emphasis on them. There was a time when things like keyword density and the placement of keywords really mattered but this was only because Google did not have the knowledge of language that it did then as it does now. Jaaxy truly will reveal so many keywords within any niche, to the point where there isn’t enough time in the day to ever tackle them all. So Kyle in saying that it’s better to focus on multiple keywords,does the subject matter always remain the same or is it diverse subject matter that makes up your content.I hope my question is clear. Each page/post on your website should focus on a particular keyword theme. You should never put too much emphasis on ONE keyword and definitely do not create many pages on your site targeting the same term. That will be viewed as total spam by the search engines. Thank you for this awesome explanation I am sure it will help me out a lot. Glad I could offer some keyword clarity for you Tommy. I’ve learned a lot about keyword research from using the Jaaxy tool inside Wealthy Affiliate and it’s been really helpful. Thanks for another great article! I will say that I use Jaaxy every time I write a new post on my blog but I am not always about how much contest is on the individual sentences, but with google alphabet the technique that I I’ve learned some of the first lessons in WA. I really feel that I am getting help putting together my articles. But first of all I would most like to make them fun and enjoyable to read. But clearly Jaaxy is a source of inspiration. That really needs to be the focus of all your content Steen, you are doing things right. Write for people, not search engines. Believe it or not, Google is not looking for the best content in the world and with every Panda or Penguin update they make they are moving closer and closer to that quality content. The don’t chase after words, they chase after content that proves to be engaging and search engines are getting better and better at determining this. If you write for people with the focus of engaging them, Google and other SE’s will only continue to find you and rank you at a higher rate. This QSR metric, I don’t know if it really works or not, but it just doesn’t work for me. One of the keywords I ranked a niche site for before it got slapped by Google is “best vacuum for pet hair”. It’s an 8000 exact searches per month term with a QSR of 195. According to you, this keyword would be relatively easy to rank for. But I can tell you with the utmost certainty that in spite of the 195 QSR, this keyword is difficult to rank for. In fact, it took me 3 months (with a good deal of backlinking work) to rank in the top 5 results for that keyword. Can you explain why a 195 QSR keyword proved difficult to rank for? 195 competing pages is not necessarily easy to rank for. Anything under 300 is ideal, but you still have to create great content and you need to remember, not every single keyword you target will rank. Over time and as you gain more and more authority in search engines, your rankings will be higher but don’t focus too much on just ONE keyword. Also, remember that thorough content tends to rank much higher. If the content base was weak in nature or your site was new, you are going to have a tougher time ranking under terms like this. With new websites I recommend that you focus under 100 (the low hanging fruit keywords) initially. Thank you Kyle for this post, everything you said is correct. I almost purchased a “Magical Article Re-writer” when I first started out, what a big mistake that would of been. I often see many marketers making the mistake of putting three affiliate links in a single post and they will sure be slapped by Google. And as you emphasized, it’s important to create engaging content first that helps people and as a marketer, we have to understand what they want and that our content provides the information that they are looking for. They will be very grateful if we can put an end to their searching. Also, using latent semantic indexing, which are relevant keywords in H tags will give marketers a better chance of ranking for different keywords. Oh yeah, that would have been a huge mistake. Article rewriters are a complete scam and I honestly can’t believe there are still people that can feel good about themselves selling programs like that. Google definitely can determine what “spun” content looks like and will send your down to the bottom of their search results (and likely omit you from rankings altogether). It sounds like you have the strategy down. Create your content for people and make your first focus helping people. Secondary is promotion because if you can’t capture someone’s interest or trust in the first place, you are going to be doomed. We all naturally write using latent semantic indexing, that is human language so that shouldn’t really be a focus. We all type words different depending on their context and that is one of Google’s ways to determine real content from manufactured content.